Originally built to collect tolls on a private road, the small Tennessee sandstone house was once owned and operated by Samuel Denton. Some three miles east of Sparta, Tennessee, located on Highway 70 East is a small, stone house built between the years 1835 and 1839. 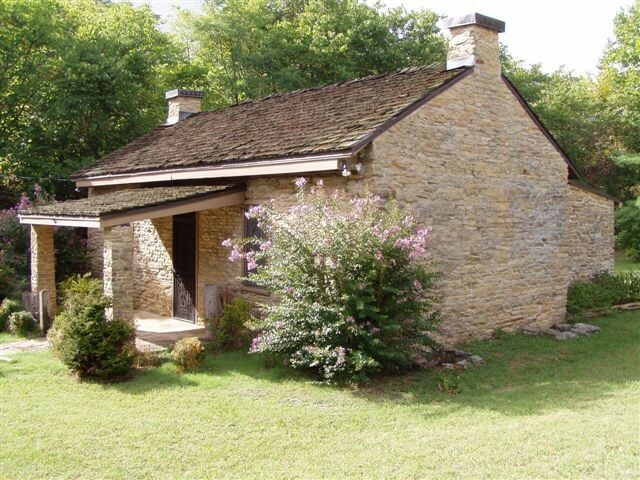 This quaint structure, now known as the Sparta Rock House, was originally built to collect tolls on a private road. It played an important role in the early development of Tennessee’s transportation system, but what is really interesting, is that it has connections to a family in Livingston whose family tree includes Dr. Moses Fisk. The late Mrs. Marie Fiske Speck, wife of the late Ray B. Speck, is the mother of William M. (Bill) Speck of Livingston, and mother-in-law of Matilda (Bussell) Speck. Mrs. Marie Fiske Speck was a great-granddaughter of Dr. Moses Fiske and wife Mrs. Nancy (Shultz) Fiske. Her parents were William Denton Fiske and wife Ermine (Hooten) Fiske of Clay County, Tennessee. Ermine (Hooten) Fiske’s maternal grandfather was a man named Samuel Denton who at one time was the owner and operator of the Sparta Rock House. This house was a stage stop along the wilderness trail and served as an inn for early travelers. Barlow and Madison Fiske, believed to be nephews of Moses Fiske, sons of Nathaniel Fiske, constructed the symmetrical three-bay, one-story Tennessee sand stone structure that is considered a significant and rare artifact of the turnpike era in Tennessee. Log pens were built to provide protection for horses. Also built nearby was a depot for the NC and St. L railroad. Andrew Jackson often stopped there on trips from Nashville to Washington. Other notable visitors who spent time at the Rock House included James K. Polk, Sam Houston, and Frank Clement, all once governors of Tennessee. Mrs. Ermine (Hooten) Fiske, mother of the late Mrs. Marie Speck, is shown here on her wedding day. Mrs. Fiske was a daughter-in-law of Dr. Moses Fiske. Information about Samuel Denton indicates that the young woman he married is believed to be a niece of Moses Fiske, whose name is Lucinda Fiske, daughter of Nathaniel Fiske. Samuel Denton was a merchant and an exporter of cotton from the South. Denton was also a well known surveyor and helped Moses Fiske when he came to Tennessee in 1797 to establish the settlement of Hilham. It is believed that at one time, Denton owned several thousand acres in what is now Clay, Putnam, Overton and Jackson counties. Some of the cotton he grew was baled for use in the construction of barriers built by Andrew Jackson in the famous Battle of New Orleans. When Denton became concerned about how his cotton was being used, he called upon his close friend Jackson to see what might be done about it. Jackson kindly but unmistakably advised Denton to get his rifle and assist with the defense against the British Regulars. After the battle, and at Jackson's special request, Denton was presented, upon his next visit to London, a tea set that was dedicated to the glory of Andrew Jackson. Individual cups and saucers of the beautiful tea set, which was hand-made and decorated in solid gold, each separate piece representing a different king or queen or England with is or her accompanying coat-of-arms, is now among the prized possessions of several descendants of Samuel Denton. One of the cups and saucers belongs to Bill and Matilda Speck. The story has been handed down in Bill’s family about tea being served from that very tea set to notable visitors such as Andrew Jackson on many occasions. Bill and Matilda Speck have just one of the cups and saucers from the set presented to Samuel Denton in London, England, for the part he played in aiding Andrew Jackson at the Battle of New Orleans. 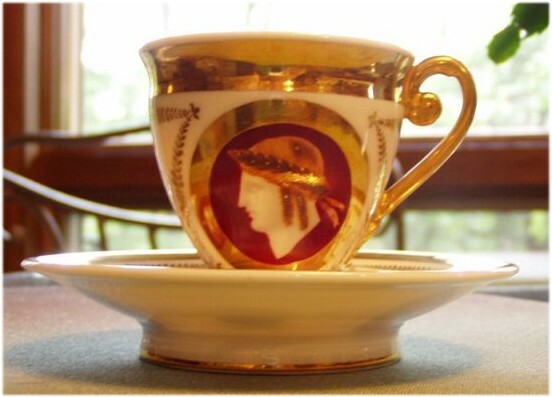 Each cup and saucer was hand-made and decorated in solid gold and represented a different king or queen or England with his or her accompanying coat-of-arms. In what was probably the 1800's, an oil painting of Samuel Denton was done. The painting, by an unknown artist, has been handed down through the generations and now also belongs to Bill and Matilda. 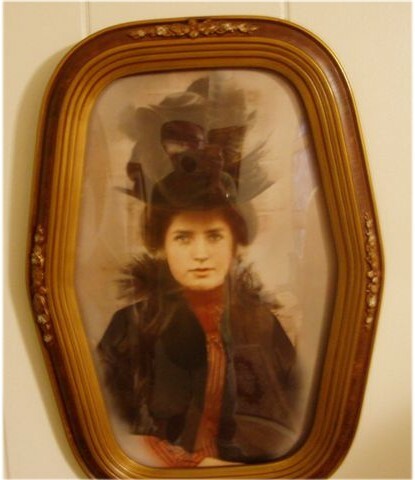 In the guest bedroom where the Denton painting hangs, a photograph taken of Ermine (Hooten) Fiske is also displayed. That picture was taken on the day she was married to William Denton Fiske. Other things from the Fiske family that Bill and Matilda have include a serving spoon and two teaspoons bearing the initials "LF" believed to have belonged to Lucinda Fiske which have been framed and placed in a shadow box. A family story has been told that the spoons were made from the melting of other items in the hopes that what might be considered just ordinary spoons be left behind should the Fiske home be invaded during the Civil War. In 1941, state funds were provided to preserve the site of the Sparta Rock House, and in 1947, restoration was begun. Then in 1959, the site was listed on the Tennessee Historical Register, and in 1973, it received the distinction of being listed on the National Historic Register. Some of the information I’ve found says that visits can be arranged by appointment by calling the Sparta Chamber of Commerce. But even if the Rock House is not open, it’s worth the drive just to walk around the grounds and view the house just from the outside. An old gravel road leads up through the woods on one side of the property. While standing out in the yard near the Rock House, it’s easy to imagine seeing a stage coach coming down over the hill, or a train making a stop nearby, bearing well known visitors such as Andrew Jackson to spend a night or two with his good friend, Samuel Denton. No doubt the tea served to Denton’s prominent guests from that special tea service tasted especially good on a cold winter night spent at the Rock House. "Born on June 13, 1827, near Sparta, White County, Tennessee, in the area known as the Rock House, Angeline Abigail Denton Campbell Terry would have been 88 in June of 1915. She died at the residence of her daughter, Mrs. Lucy Mitchell, of Livingston, on January 22, 1915, after a brief illness. She was the younger of two children, both girls. Her older sister, Sarah, having married Ormel Fiske, the father of the writer, died at Hilham in September, 1982, at the age of about 68." "Samuel Denton, their father, was a native of New Jersey, and came to this state about the year 1803, and settled in White County. Their mother, Lucinda Fiske, was a native of New Braintree, Massachusetts, and came to Overton County in 1803 with her parents who settled near Hilham when she was only about three years old." "Mrs. Terry was twice married, her first husband being Robert C. Burton, by whom she had two children, twin boys, Will and Samuel Denton Burton. Will died when a child, and S.D. Burton eventually moved to the state of Oklahoma. After the death of her first husband, she married Elijah W. Terry, by whom she had the following children, now living: Mrs. Emma Burgess; Mrs Lucy I. Mitchell, wife of R.L. Mitchell, Jr., of Livingston; Mrs. Celina V. Dever; Adrian M. Terry; and R.Y. Terry. She was also step-mother to six children from her husband’s first marriage, whose names were James W. Terry; W.L. Terry; Jesse Terry, Julia Cook; Rettie Lynn; and Elizabeth Johnson." "Mrs. Terry was noted for untiring energy and her high purpose and goodness of heart. It seemed a part of her mission in life was to look after those in need or distress, and she made it her business to see that those needing help got it. She was a great worker, a woman of superior sense and ability, and had well defined and fixed ideals of her own, which she lived up to the best her surroundings allowed. She had a high sense of honor, and despised a liar or dishonest person. She was kind and hospitable to all who went about her, being lavish in providing for the wants of her guests, and kind and motherly to all, so she won and kept the love and esteem of her step-children who loved her almost as though she were their own mother." "She became a member of the Christian church at an early age, and although not a frequent church goer, she lived a practical Christian life, thereby proving her faith by her works. Her life was an application of the cardinal principles of Christianity, void of empty show and hollow pretense, but alive and aglow with good deeds strewn all along her life’s pathway. Although she was a very earnest woman full of purpose and push, she was also of a jovial and fun loving disposition, mingling mirth and the work and duties of each day. Nor did age dim her sunny temperament or render her petulant or childish. Even almost to the day of her death, although very deaf and nearly blind, she retained her cheerful spirit, going about singing the songs of her youth and caring for herself in a great measure, because, as she said, she did not wish to be of trouble to anyone." "For several years prior to her death, her memory of passing events was faulty, so that she could not retain recent occurrences, but her mind was otherwise apparently unimpaired, and she loved to dwell upon the scenes of the past. She was whole souled and thorough going in all her ways and whatever she did, she did with all her might." "Her husband died in 1900 and she remained at the old home place and lived with a tenant until about a year ago, when, after repeated persuasions, she yielded to the request of her daughter, Mrs. Lucy Mitchell, and went to Livingston where she remained until her death. Mrs. Lucy Mitchell, Mrs. Julia Cook and Mrs. Emma Burgess were the only children with her during her last illness. She was buried at Smyrna near her old home in Putnam County. She yearned to die after losing her hearing and sight, saying she was ready to go at any time, and that she did not believe it wrong to desire to go. If one reaps as one has sown, and there is an Elysium where tired and weary souls go and are at rest to meet with loved one gone before, after this life’s fitful glow, then we believe our dear old aunt has gone to that happy land." Evidently, Angeline Abigail Denton Campbell Terry lived her life in a pretty ordinary way and didn’t achieve what some might consider great accomplishments, but as demonstrated in the long and lengthy obituary written by her nephew, she lived an exemplary life. Of all the many good things her nephew used to describe an aunt that was evidently very special to him, I especially liked the one that says: "Her life was an application of the cardinal principles of Christianity, void of empty show and hollow pretense, but alive and aglow with good deeds strewn all along her life’s pathway." I couldn’t think of a better way to live. How many people do you know whose life can truthfully be described in this manner? Some information contained in an additional newspaper article printed many years later tells about the nephew and writer of Mrs. Terry’s obituary, William D. Fiske, a grandson of Dr. Moses Fiske. He is described as having owned and operated a newspaper in Celina for forty years called The Bugle. After his death, his widow, Mrs. Ermine Hooten Fiske, a mother of eight children, took up the work her husband left at his death, and never missed an issue, always getting the paper to press on time. When asked why she continued the work of her husband, she said, "It was his wish that the paper remain in the family, so I could not see the work he loved fall into the hands of someone other than the family." The work involved included the type being set by hand and the sheet run off on an old Washington hand-press which was obsolete even in the day the paper was printed. The forms were inked by a band roller. All three of William D. Fiske and Mrs. Ermine Fiske’s sons were also involved in the newspaper business. The eldest son, Alva Fiske, was connected with the Washington Evening Star in Washington, D.C. The youngest son, Genie Elkin, worked along side his mother following the death of his father, but had been called for a position in the government printing office in Washington, D.C., at the time the newspaper article was written about his parents. Another son, Moses, was also connected with a printing concern in San Antonio, Texas. They each got their beginning in the little shop operated by their parents. It was noted that Mrs. Ermine Fiske was a democrat while her husband voted the Socialist ticket. "We always went to the polls together and voted according to our individual way of thinking," she said. The article concluded by saying that Mrs. Fiske often put in from ten to twelve hours a day in her office, but always found time to manage the affairs of her home. William D. Fiske and wife Ermine Fiske were the parents of the late Mrs. Marie (Fiske) Speck, wife of the late Ray B. Speck, and grandparents of Bill Speck of Livingston.